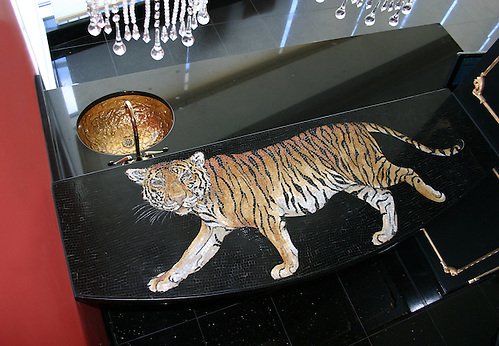 Or, Lions and Tigers and…Zebras! 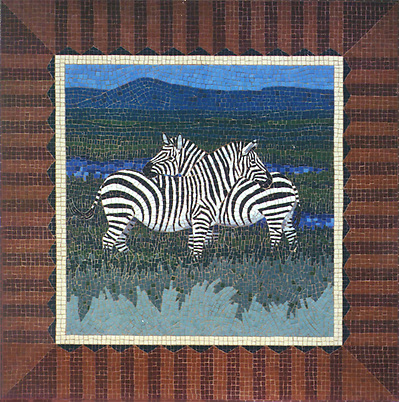 This is one of my first mosaics a la 1992. It was made from porcelain tiles from the local American Olean distributorship in Philadelphia. I must have driven general manager Rick Odorico crazy–wandering into his shop with a baby on my hip, asking for “two square feet” of about fifteen different colors that were all on the top shelf. Last I heard Rick had been promoted inside Dal-tile to a very stratospheric level. Rick, if you’re out there, a big THANK YOU. Studium, one of our favorite showrooms in New York (hi there David, Berna and Lucio! ), originally suggested we recolor “zebrano”, and a clever suggestion it was. We also have a lovely two-shades-of-blue and white combo and a celadon green/gray/white combo which I have yet to post. Then again, you know us, we can’t ever say “no”, so you can order it in virtually any color you want, even in GLASS if you like that texture better. So go crazy. Show us some skin. P.S. If you live anywhere near Denver (Oct. 13), Aspen (Oct. 14) or Vail (Oct 15): this week yours truly will be giving mosaic seminars at the Decorative Materials Showrooms. I look forward to meeting you! That stone interpretation of zebra wood is stunning Sara. It reminds me of wood fibers seen at high magnification. Brilliant! Your blogs keep getting better and better. Thanks for the inspiration!!! You ARE a rock star. I think we need to go on a company trip to Africa for safari….to get some more inspiration. ??? Sara? It depends on who you ask. Spell checkers the world over say that it's two words. People in the trade use it as one word. So I suppose the answer depends on who's using the term. In the UK they dispense with this divisive issue completely and call it a splash back, two words. Speaking of which, how are the plans for your back splash/ backsplash/ splash back coming? Great post!! 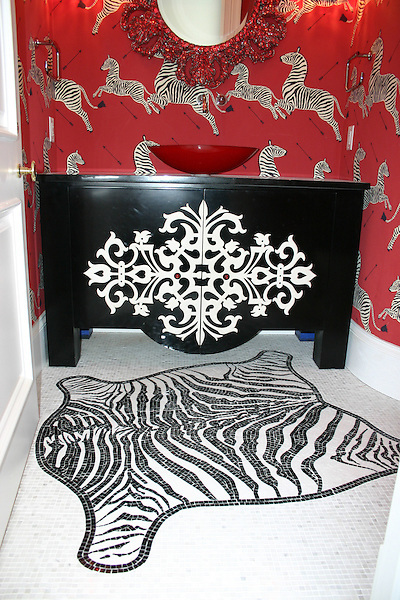 I love the zebra re done in wood! So cool!! Wow!! 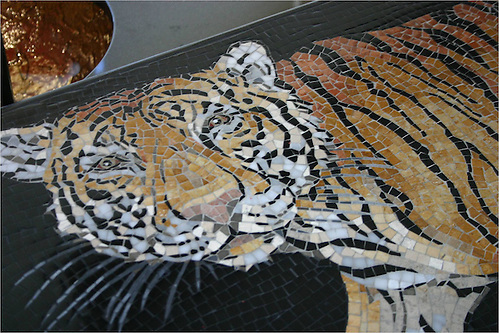 These mosaics are amazing — especially the tiger. He's absolutely stunning!! 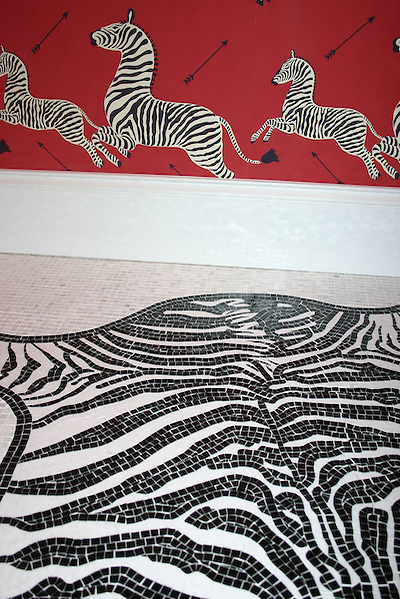 I LOVE that you created a zebrano-inspired mosaic. So creative and beautiful. 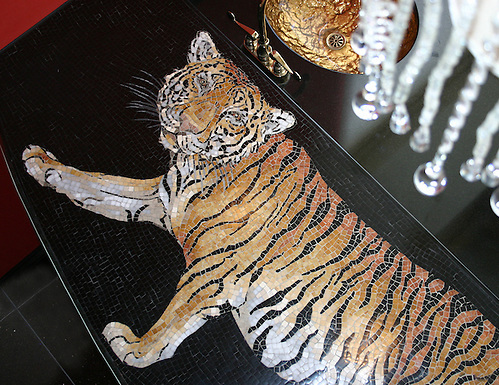 Thank you SO much for letting me know that you are the firm behind the beautiful mosaics in some of Jim Howards designs! I am in awe, and I can't wait to explore your site some more. no problem. Like I said, he's a superstar–always using our patterns in the best possible ways. btw, I love the name of your blog! Gorgeous Sara! Really spectacular. Boy would I love to use your work in one of my designs!! !